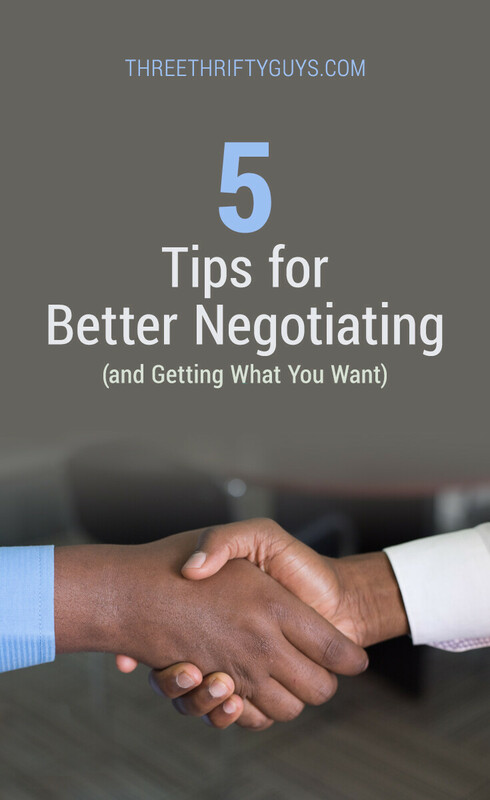 One of the better books I’ve read in the past several years (since this post was first published in 2013) dealt with the subject of negotiation. Negotiation Boot Camp by Ed Brodow is a great resource if you are looking to improve your negotiating skills (and I don’t know many who aren’t). If you think about it, we use negotiation in various ways almost every day of our life. From conflict resolution, dealing with customers or vendors, attempting to lower your cable bill, to asking for a raise. The key to negotiation is to get what you need/want while – at the same time (if possible) not cheating or neglecting the other person’s needs/wants. And, that is the real challenge. I mentioned my attempt at getting a 30% raise at work years ago. What I didn’t tell you is that I was dealing with one of the most talented negotiators I’ve ever met. My boss routinely makes seven-figure deals with Fortune 500 companies while dealing with other, very highly skilled “bargainers”. So, while I didn’t get exactly what I was looking for during my raise request – I did learn a few things. I’m not expert at the art yet – but I would like to tell you what Brodow (dubbed the “King of Negotiators” by SEC Chairman Harvey Pitt) talks about in his book and what I’ve also picked up from my boss. I believe if we can increase our negotiating prowess, we’ll have an easier time getting what we need/want in a dignified manner. After you’re done negotiating, you may want to see how I’m able to pay $11.40 for my cell phone bill. One of the first points that Brodow makes in his book is to listen. Listening is a fairly underrated skill in today’s world. It’s so easy to assume what others are saying OR (as is my habit from time to time) finish what others are saying for them. Listening is definitely one of those things that comes easier to others. I would say I’m an average listener. I have a tendency to have ADD and mentally doze off when others are talking. I really have to concentrate on what others are saying and process things. Brodow stresses the importance of listening – because it will do two things: it will cause the other party to feel respected and it will build trust (another very important aspect in any negotiation). Listening entails making sure what you’ve heard is actually correct. My boss does this well. He will repeat to you (mirror) what you’ve said to be sure he is understanding. How many times are you so focused on getting what you want in a negotiation – you don’t even think about the other person? When I read that Brodow is always seeking a “win-win” solution in a bargaining deal, I was a bit shocked. It seems to go against the purpose of negotiation. Aren’t you supposed to knock the other out and take it all?! In reality – the “win-win” negotiators seem to have the most success. We try to use this approach with my step-son and it seems to be paying off. For example – like most kids his age, he is very independent. He wants us to “stay out of his life” as much as possible. And while we can’t fully do this as long as we are supporting him and paying for his food/roof – we can still aim for a win-win solution. So we’ll say “to get us out of your life more – you need to______”. So, he will be getting what he wants (us, out of his life – gaining more freedom/independence) and we will be getting what we need (him following rules, getting done what needs to get done, etc.). A win-win outcome really is the best way to approach negotiations. Another key aspect to negotiating is to be on the lookout for things you and the other party share in common. If you ever watch the show “American Pickers” on the History Channel – you know how affective Mike and Frank (the Pickers) are at getting a decent deal on collectibles. One of the objects Mike loves to find are old bicycles. And sometimes – when he is dealing with another bike enthusiast – he will try and talk about their love for old bikes. When you can share a common interest or find a common ground with another person – they will have a harder time being in confrontation with you. One way another party will seek to end a negotiation (before you can get what you need/want) is to offer a counter – or objection to your proposal. For example – during my request to lower our cable bill, the representative said “I don’t have the authority to give you that“.. They were hoping to end the discussion and that I would give up. It works – because many do. But, to counter a counter, acknowledge them. Sometimes when we are in negotiation we get so centered on the one thing – we forget there might be other possibilities. Brodow recommends thinking about a bigger pie. It’s an attempt to negotiate outside the box. During my raise request, my boss wasn’t able to give me what I wanted. But, he talked about working together to get that raise down the road through a promotion or more responsibility. Thinking outside the box – you are able to offer more than what was originally on the table, increasing your odds of succeeding in the negotiation. Have you used any of these tactics during your negotiations? I truly think if we can get better at negotiating, the result will be people getting along better (better listeners and win-win outcomes). Give yourself an edge with this brand new second edition of the bestselling book by negotiation expert Ed Brodow, creator of the acclaimed Negotiation Boot Camp® Seminars. Update 9/13/17: Here’s another great tip about negotiations and getting what you want: never let the other party know you are desperate. Why Have Auto Dealerships Stopped Negotiating? Great article Aaron. Ed is a master! 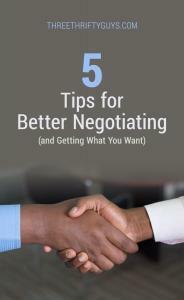 You can also apply negotiation strategies with your work and personal relationships. For instance, many of us are tired of “dealing” with difficult people and just want the whining, complaining and negativity to stop. Try using the same negotiation techniques and see if you don’t get a better result! @Adria – Way to be thinking! You can negotiate almost anything. I had just taken a Dave Ramsey course, when I received a knock at my door. He told me there was a law suit against the company that did our siding. Long story short they were willing to handle paperwork etc for a 15% fee. I sent him home and did my homework, yes there was a law suit and yes there was a lot of paperwork and court dates. When he came back I asked him if he could reduce his fee. He smiled and said, you are the 99th person that I have spoke to and NOT one has asked me this. I am authorized to drop the rate. One question, resulted in 100’s of dollars of savings. Aaron — Excellent review of my book. Thank you. We watch Pickers from time to time and always have to laugh when Frank or Mike tell the person they’re working with to let them feel like they’re getting a deal. If I were the person selling the item I think I’d say something like why should I do that for you, Lol! I like to negotiate or haggle when we’re shopping…it’s as simple as asking and you never know what they’ll say. @John – I agree – never hurts to ask. @Ed – Thanks for stopping by!